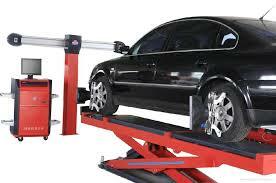 Wheel alignment, sometimes referred to as breaking or tracking, is part of standard automobile maintenance that consists of adjusting the angles of wheels to the car manufacturer specifications. The purpose of these adjustments is to reduce tyre wear, and to ensure that vehicle travel is straight and true (without "pulling" to one side).Alignment angles can also be altered beyond the maker's specifications to obtain a specific handling characteristic. Motorsport and off-road applications may call for angles to be adjusted well beyond "normal", for a variety of reasons.